Some people think that the European LCS will be terriblethis year without Deman and Joe Miller, but it isn’t just the casters that make the games fun to watch. Some people think that the European LCS will be terrible this year without Deman and Joe Miller, but it isn’t just the casters that make the games fun to watch. 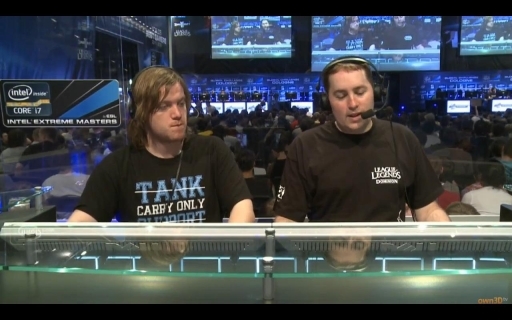 Joe and Deman are great casters who pioneered League of Legends casting, and the picture below shows just how far they have helped to bring pro gaming. Although they will be sorely missed by many, myself included, they do not make or break the broadcast. On top of that, the people complaining about them not working with Riot any more do not even watch EU. Also, it is clearly the best non-Chinese or Korean region there is and sometimes matches up with China. NA, on the other hand, has never won Worlds, and multiple teams have needed to take weaker European talent to do well in NA. Now, why is EU going to be amazing this year? EU LCS will be so much better this year than any other year because of the people in the game. Unicorns of Love is a great new team that will be pretty fun to watch. Roccat will be great to watch whether they pick up Ryu or Nukeduck. It will be interesting to see the return of Forg1ven, and SK has the potential to do especially well this year. Alliance will just keep improving to become the super team they are meant to be. Now that H2K is in, as of a few hours ago, I will be very excited to see them play, as I have been a fan since their start in the Challenger Series. I also think that the new jungle will make EU a more interesting scene than NA because of how well-suited the jungle is to EU’s general style. EU has always been a more passive region, but when they do something, it is done right. Ganks are less common and fights and objective control must be perfectly calculated. Teams in the EU LCS will be showing up to play. SK will be a much more mechanically adept team this season, with their two new additions. We have to think about who they are and who they are replacing. SK has always been an intelligent team. This season, they keep the strategic mind of nRated and swap out Jesiz and Candy Panda for more talented people, Forg1ven and Fox (formerly watdefox). SK compared to an NA team, like LMQ last season, would be able to dominate. LMQ was number one in NA for most of the Summer Split, and SK ended up finishing third. That just goes to show how much better Europe will be when comparing the number one team NA to what will now be a mid+ team EU. Alliance may not have done well at IEM San Jose or at Worlds, but they had problems during those times. At Worlds, there was turmoil, and at IEM they did not have enough time to get a groove. Alliance can still be number one this split. Rekkles may not be considered much better than Tabzz, but he will be better for the team as a whole. Roccat could be the number one team in Europe, any reasonably good team can. As I think about this, it would be cool to see Overpow move mid in order to make room for Flame. Even better, Overpower gone and a Flame and Ryu combo instead, which would rock the EU LCS. Woolite may be an upgrade to Celaver, but he is not much better. Roccat’s first priority, after finding a permanent mid, should be replacing Woolite. UOL had shown some real skill at IEM San Jose, and if it develops further, and it surely will, they could go to Worlds and dominate Europe. They are a fun team to watch that aren’t afraid to make plays. Teams like UOL and changes to some players will make the upcoming season more active than it was last year. Fnatic, MYM, Gambit, and the Copenhagen Wolves will likely not do well this coming split. Fnatic lost two very good team members and one washed up jungler. What’s left is one good support and an odd top laner. Gambit has fallen off since Alex Ich’s departure and had to play in relegation. The Copenhagen Wolves were never good and some how remain in the LCS. MYM will probably be horrible, but they have H0R0 and a new support, which could change things. There are some amazing teams, way better than NA, in Europe. C9 may have won IEM San Jose, but they are not good in the regular season team. Alliance, on the other hand, has not done so well at the last two tournaments, but their regular season is great. A person watching a tournament has probably come to see Cloud 9, the number one NA team, play the number one EU team, Alliance. Why not go watch the regular season in Europe to see Alliance play, if you happen to watch C9 during the NA regular season? The point is that if you like watching Alliance and C9 at tournaments, then you might as well watch Alliance in the LCS because that is where they perform best. The best team most of the year will be in Europe, so logically, if a person could only watch one western league, it would be better to watch EU. Most people have plenty of time on their hands so that they can watch both leagues. If you have all of this time, why not watch EU, especially if it is going to be a better scene to watch. When I come to the conclusion that EU is better to watch than NA, I take the whole scene. SK v.s. Roccat is a whole lot better than Curse Academy v.s. EG. On the topic of casters, people should not worry because Riot could import a few of their numerous NA casters to EU, or they could find someway to tie in the EU broadcast with NA casters, like how it is done with the Challenger Scene. Joe and Deman may also come back every once in a while to cast the LCS. If the worst case scenario happens and new casters are put in, it will probably not be that bad. Even though Atlus and Spawn were new casters to people in NA, they still were very well received. Who knows, maybe the EU LCS will get two even better casters. DO YOU HAVE ANYTHING BETTER TO DO WHEN PLAYING LEAGUE OR SITTING AROUND! ?